The sound of yips, yelps, screams and squabbles is an intriguing sound, but hardly the sound of a sophisticated predator. Yet, African wild dog (or painted wolf) is considered the most successful hunter in Africa. They are a beautiful contradiction in the African ecosystem. With an endearing quirkiness to them, with long, lanky legs and mickey mouse ears, exquisite colouring and an infectious joy in their nature. Household puppies rolling around and chasing each other one moment and highly-focused hunters the next moment. Part of their struggle is this enduring narrative that only follows them on the hunt and dubs them ‘killing machines’. But that is why I prefer to tell the story of the 'underdog'. We were walking on the shoreline of the Zambezi River in Mana Pools, a place where animals and humans roam on foot in harmony. Our senses were heightened, reconnecting to the primal insights of the environment; listening, watching and walking. We stopped to admire an impressive eland, amazed by his size. Our incredible guide Alf spotted a round ear in the distance. One of the painted wolves had stood up and Alf’s hawk-like eyes had spotted him. Our hearts pounded in our ears as we started walking closer to inspect. We stopped under a tree and there they were. 17 of them, 7 adults and 10 pups. They were perfectly framed, resting under two large Ana trees. Content with us in their presence. Alf said we could edge a bit closer. Slowly moving, staying as close to the ground as possible. Their ears perked as they became more aware of unknown sounds in their territory while their pups tussled around with each other. Painted wolves hunt in the day to avoid larger predators. We watched one of them regurgitated some of its kill which is how they feed the pups, the pups swarmed around yapping and fighting in excitement. The next day, on route to Zambezi Expeditions, we stumbled across the family again. On the edge of a dry riverbed, they were spread between a termite mound and some trees. Looking at us curiously, almost as if they recognised us, wishful thinking maybe. We edged closer and closer. This time the adults really warned us, standing their ground. Growling and yapping, protecting their young and their territory. We crossed the dry riverbed, to create a barrier between us and them. We sat on the other side, behind a dead tree watching as they moved into the sun, played, stretched, greeted each other and then set off into the distance, front row seats to admiring these creatures in their natural habitat. A privileged witness to the daily happenings of this wild dog family. In just two days we had seen the dogs twice, they were almost becoming family. "The family is one of the most powerful forces in nature" - Sir David Attenborough. And this is what the new, highly anticipated Sir David Attenborough series 'Dynasties' is framed around. The series leverages off the principle of the strength and protection but also power struggles within a family and how this relates to their external survival challenges. Five Dynasties; lion, tiger, painted wolf, chimpanzee, and the emperor penguin. These five, beloved species must endure dwindling environment, rival predators, politics within the lineage and human impact. The Dynasties story is an important narrative for wild dogs, to show the other side to these animals when they are not hunting. That they are complex, charming and in need of space to flourish. 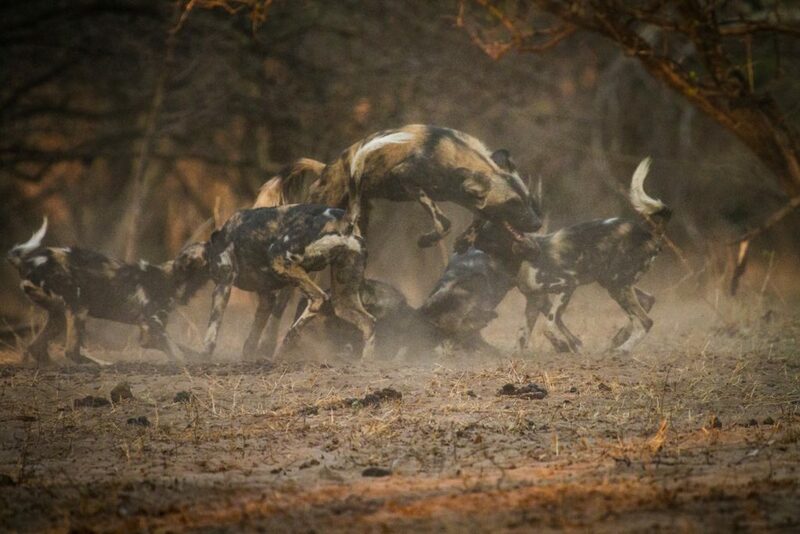 The wild dogs are some of nature’s most enigmatic and elusive creatures. They are constantly ‘painted’ as killing machines, and while they are the most effective hunters, they still face many challenges, including this enduring narrative of killers, defending their young from larger predators and human impact. In actual fact, they are as endearing as our beloved domestic dogs; playful, inquisitive and social. The stars of this episode survive in the arena of the Zambezi escarpment, Mana Pools. Renowned as one of the least developed national parks in Southern Africa, almost 70% of the park is only traversable by foot. An explorers paradise. By being able to walk in a big game national park, the barriers between you and nature are removed, it truly is one of the most engaging ways to experience wilderness and wildlife. The beloved painted wolves, or wild dogs as they are known, fight daily for their place within this ecosystem. To follow in the traces of Sir David Attenborough, we have opportunities for you to track and walk alongside them. 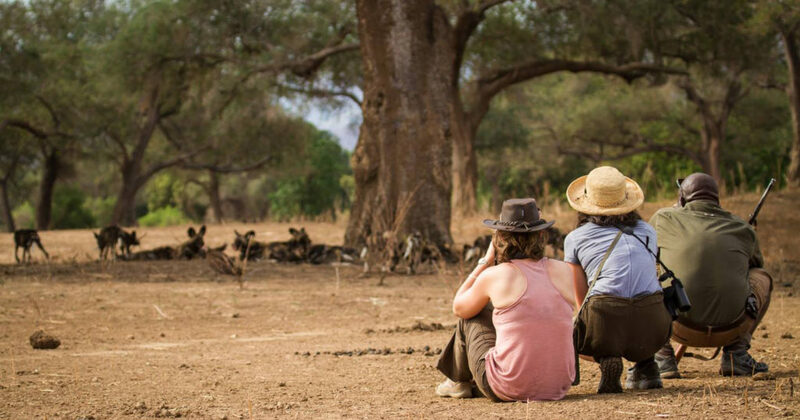 We have come up with a 'Meet the wild dogs' itinerary specifically designed around the unique experience of tracking these fascinating creatures. Sign up for our newsletter, at the bottom of this page, to hear all updates about the wild dogs and tours.